← Entertainers Worldwide in the Press! If you are wanting to stick to tradition when planning your wedding day, you might be surprised to see what some of the newer traditions are when it comes to wedding entertainment. From your ceremony and drinks reception all the way through to when you are partying the night away as a newly married couple, here we have put together our top 10 most popular wedding entertainment ideas for your big day! During your wedding ceremony, there are certain parts that really benefit from background music and there is no better way to achieve this than with a live group or musician. String Quartets are one of the most popular ways to enhance your wedding ceremony during the quieter parts of your ceremony, such as while your guests are being seated, as you walk down the aisle (the processional), during the signing of the wedding register and of course once you are married walking hand in hand as a married couple. A String Quartet offers quite an unusual sound as two violins, a viola and a cello are combined to create a whimsical and stunning sound. Whether you want to walk down the aisle to the “Bridal Chorus” by Wagner, or something more modern, choose a String Quartet to start off your wedding day in style! If space is an issue at your wedding ceremony but you still want the magical atmosphere of a live musician, why not look at booking a solo instrumentalist, such as a Violinist? 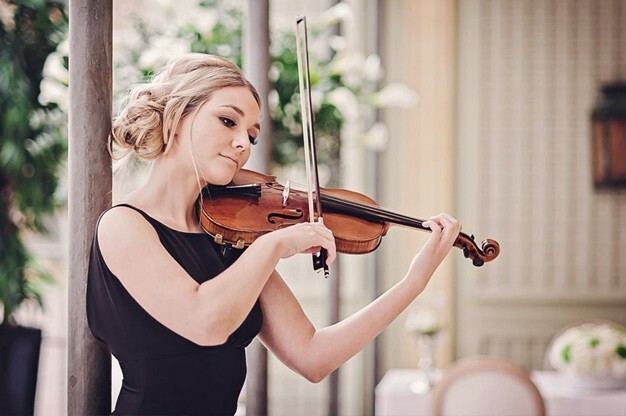 A Violinist will also be able to provide you with a variety of music, from the traditional to present day tracks – we highly recommend asking what music they can perform before booking, especially if you have something special in mind. Usually hiring one single musician works out cheaper than hiring a group, depending on their experience of course! 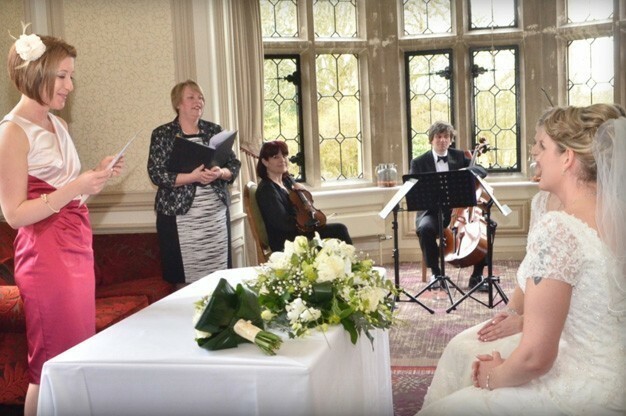 Want to find a Violinist to perform at your wedding ceremony? Click here to browse our listings right now! The harp is said to be the most romantic instrument in the World, so it’s no surprise that it lands its way into our top 10 most popular wedding entertainment ideas! Harpists are very talented musicians who pluck and strum at their harp to create a gentle background atmosphere. You are likely to find a harpist at most wedding fayres, but we have our very own selection available to choose from – with more joining our website on a regular basis! You might think that hiring a Harpist means you are limited to classical music, but you’ll be surprised that they offer just as much flexibility as a Violinist or other solo musician. 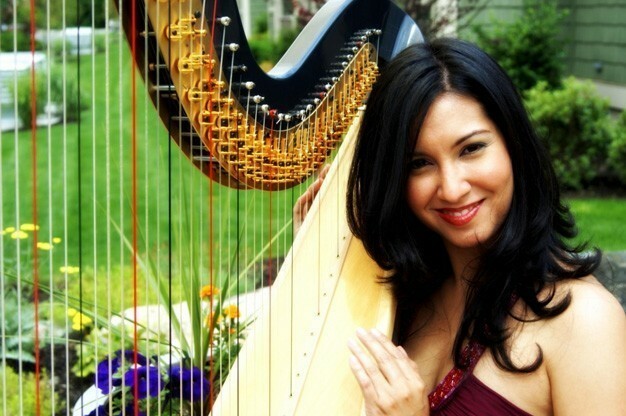 Take a look at all of our available Harpists on our entertainment directory! For Celtic and Scottish weddings, a good choice in ceremony music is the Bagpiper. Bagpipers are not everyone’s taste however they add charm to any highlands wedding! Usually couples who choose a bagpiper for their grand entrance opt for traditional Scottish classics, such as “The Skye Boat Song” or “Amazing Grace”. Choosing bagpipers to perform at your wedding ceremony certainly offers traditional entertainment! Find and book the perfect Bagpiper using our free website today. 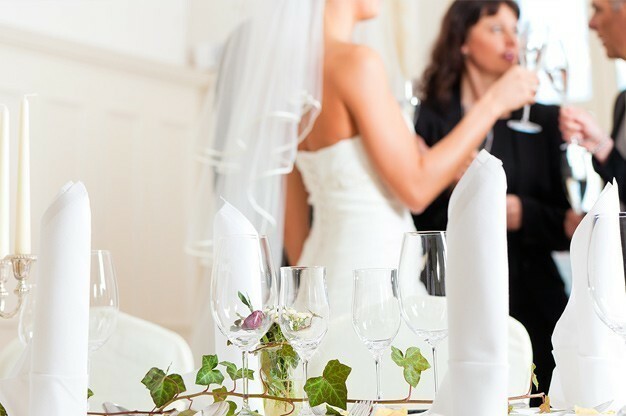 Now we have your wedding ceremony covered, let’s move onto your drinks reception and wedding breakfast. During your drinks reception, you will be whisked away for your wedding photography and your guests will be left to mingle among themselves. If all of your guests know each other, this isn’t so bad as they will use this opportunity to catch up and chat among themselves, but sometimes you will find that groups of guests who don’t know each other won’t mix. That’s where a Close-Up Magician can come in handy! Using this type of interactive entertainment will get your guests involved and interested as a Close-Up Magician works his/her magic around the room performing illusions to small groups of guests. If you decide to book this type of entertainment for your wedding breakfast, the principle is the same apart from they will go around the tables performing between meal courses. 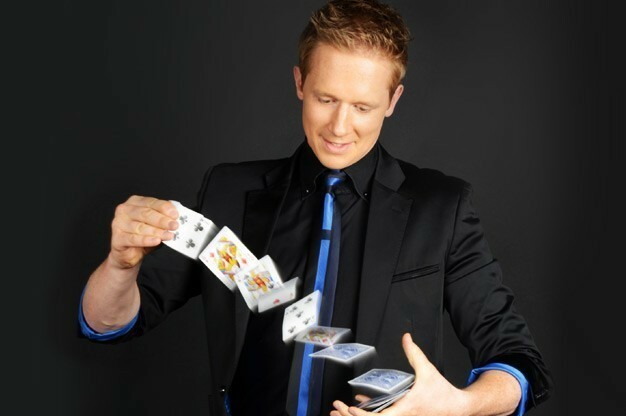 Click here to find a Close-Up Magician to perform at your own wedding! Another great choice in entertainment for during your wedding breakfast is the Caricaturist. This has become a relatively new tradition which is seen across many weddings each year! A Caricaturist is a talented artist who can easily sketch each guest in a matter of minutes. Their drawings are usually very funny as they emphasise certain features, such as the mouth, nose and eyes. One benefit of choosing a Caricaturist for your wedding day is that you will also be sketched and given your drawing to keep as a memento of your special day! Browse our listings to find a Caricaturist near you right now! Moving onto the evening reception, this part of your wedding day is where you can really relax and enjoy the party! One of the best ways to achieve the perfect party atmosphere is to hire a live band and we have our very own section dedicated to wedding bands. 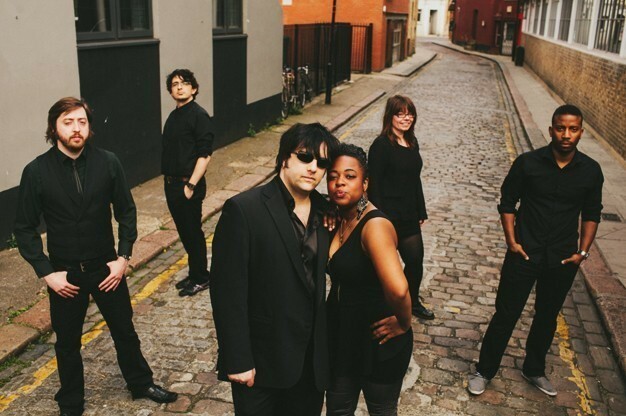 These bands have masses of experience performing at weddings and each one has their own selection of music that they can play, also known as their repertoire. Playing popular hits from many eras, a Wedding Band will get guests up dancing and can also make announcements, such as the first dance and when the evening buffet is being served! Find the perfect Wedding Band by reading our acts’ profile pages before you book! A more affordable alternative to booking a Wedding Band for your evening reception is the Wedding DJ. This is probably the most popular type of wedding entertainment for many reasons. The price to hire a wedding DJ is usually a lot less than a live band and their selection of music is huge since they only need to license the music, rather than learn and perform it! A Wedding DJ is full of charm and works their magic with your guests as they take requests, make announcements and banter with guests through their microphone. Since they aren’t performing live, Wedding DJ’s can play their tracks from the moment your wedding reception starts, up until the very end! Check out our entertainment directory and find a Wedding DJ for your own evening reception. On our website, we not only have performers and entertainers, but event services too. Chocolate fountains are a popular choice for wedding evening receptions to serve alongside a buffet and are popular with children and adults alike! Chocolate fountain companies hire our chocolate fountains along with everything you might need to fill it and accompany it too – pineapple, strawberries and marshmallows are firm favourites! You will find guests flocking around a chocolate fountain and going back for more, making them a very worthwhile investment. The main advantage of hiring a chocolate fountain is that the company responsible usually comes in and clears it away too – saving you the hassle on your wedding night! Look through our event services section to find a Chocolate Fountain company for your own big day! Another popular addition to wedding evening receptions that we are seeing across many weddings is the fireworks display. Adding this type of entertainment towards the end of your celebrations gives you and your guests one more thing to look forward to and now you can hire companies that organise everything for you – making it safer and much easier to plan into your own wedding day. Leave it to the professionals and book a Fireworks Display Company to end your wedding day with a dramatic performance! We hope that you have enjoyed reading about our top 10 most popular wedding entertainment ideas and that today’s article has given you plenty of inspiration to start booking entertainment for your own wedding day. Booking an act has never been easier – simply take a look at each of our entertainers’ profile pages where you can read all about them and in some instances, watch video, listen to audio and check out their performance photographs. If you find an act that you would like to book, simply click on the “Request a Quote via E-mail” button and you can fill in a simple form which gets sent directly to your chosen performer. We do not act as a middle-man or agency and there is no cost to do this – no hidden fees and no commission on top of your booking! Save time and money by booking your entertainment through our website. Want to Save Time When Booking Your Entertainment? Sit back, relax and have your Entertainment contact you! By adding a post to our website e.g. ‘Wedding Band required for Wedding Evening Reception on 10th March’, our available acts will contact you by email. Look at the Entertainer’s publicity, decide which is your favourite and contact them directly! The entire service is completely free of charge. Tell us what entertainment you are looking for now and we will do the rest! Contact us.